Don’t miss my Free Toy Story Party Printables and find tons of inspirations on my Toy Story Pinterest Board. I spent months searching for Toy Story birthday party ideas, taking notes and planning my approach. Finally it was time for the big party, and I believe it was everything my spunky three year old dreamed of. The Toy Story party invitations were inspired by Sissy’s “best friends” Woody, Jessie and Buzz and set the tone for all of the other party decorations. Of course, I had to make coordinating Thank You notes. I spent many late nights crafting the perfect details from Sissy’s favorite Toy Story moments for the party including The Claw. 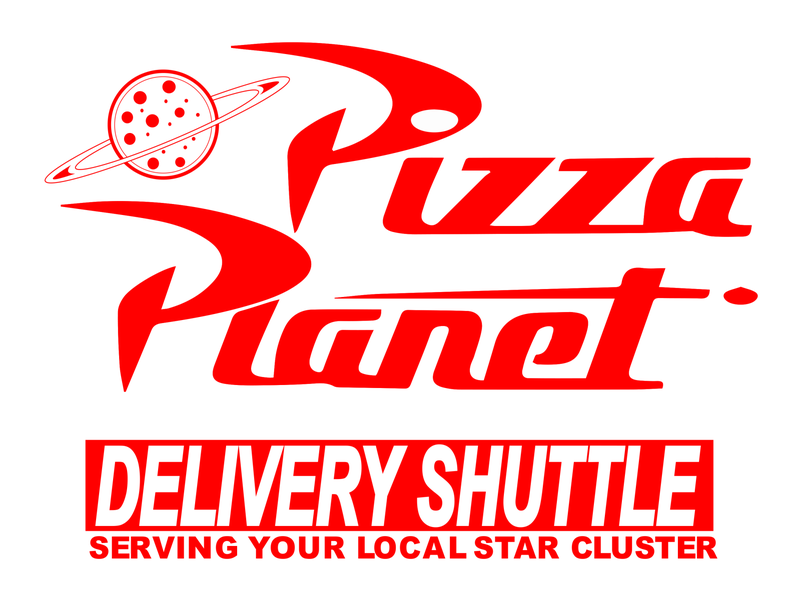 Since I planned to serve lunch at the party, a DIY Pizza Planet Sign was a must. I searched all over for the right logo, and finally ended up having my husband help by creating a vector file so I could print it big enough for the sign. I think my favorite part of the whole party was how cute Sissy was in her Jessie Costume. The shirt says, “Cowgirls Rock,” and she spent weeks repeating that saying. Sources: Jessie shirt, Jessie Hat (similar), Jessie skirt, Jessie boots. I decided not to do any organized games for the little ones, but I did have a couple of Toy Story games available to play for the bigger kids to play on their own — Toy Story Mania for the Wii and Toy Story Ker Plunk (I found Ker Plunk at a local consignment shop). When I asked Sissy what she wanted for a cake, she asked for a chocolate cake with Woody, Jessie and Buzz and sprinkles. So we picked out a store-bought cake with balloons and sprinkles and I added Woody, Jessie and Buzz figurines to the cake. She was delighted. Out of all of my projects for the party, the Mr. and Mrs. Potato head craft project was the most time-consuming to prep. My sweet husband spent many nights tracing and cutting out parts on my behalf while I worked on other projects. You never know how well an idea will go over with kids, so I was crazy excited that the kids adored the project. Every single kid sat down to make Mr. and Mrs. Potato Head. It was awesome. Make your own Mr and Mrs Potato Head craft with printable parts. Download the clouds template here. My favorite photobooth prop was the DIY Etch Sketch frame. I made the signs using my Chalk Board Sign Photobooth props template. For the Toy Story photobooth props, I used the props designed by Merriment Design. There were a lot of little details that made this party special. Whew! That’s a lot of details for one post! (It’s a lot of detail for one party too, but that’s another story!) All of the printables from my party — cupcake toppers, signs, bunting, banners, etc. are available free. Get all of the Toy Story Party Printables here. For now, don’t miss the 12 Toy Story Coloring Pages I rounded up. JEN, YOU ARE AMAZING! SO TALENTED AND I KNOW YOU MADE IT WITH LOVE. THAT IS ADORABLE. ,I ENJOYED PEAKING IN ON YOUR PLANS. THANKS FOR SHARING. Thanks Brenda! It was a lot of fun creating it, and the joy on Sissy’s face was priceless! OH I LOVE IT!! Every detail is SO perfect! Thanks Sara!! It was so much fun to create! This party is AMAZING!! You are so creative! I was wondering if you had a place to purchase your amazing printables?! I would love them for my son’s 2nd birthday! Love this! I’m planning a TS party for my daughter now, and you have so many of the ideas I was planning to do too! Where did you find the Jessie hats and rockets with mini aliens? Where did you ever find the small boots for “There’s a snake in my boot”? Have you ever considered buying a cricut? I love your party it turned out awesome! I’m also doing the same theme for my daughter’s 3rd birthday. I was wondering if you have the signs with her name on it or anything that says Sydney’s Story left for sale? Do you have a Sydney too?! 🙂 Email me [email protected]. Hi Felicia – Thank you so much. It was defiantly a labor of love. Unfortunately, I sold all of the items I made this summer. Where are the printables? This is all so cute! Jen, Did you end up making the printables – the bunting, signs, etc? I would love to have them! It’s all adorable! This has been the inspiration for my son’s 2nd birthday! How did you get the clouds for the background? The only piece I’m missing! Could you email me the cloud image too please? I have already made a photo booth and have been searching for a background for it. This would be perfect! Great party! Love the claw and aliens too. Perfect extra touch. I did make it. Feel free to reach out to me by email – [email protected] – if you would like to order a custom one. How much would you charge to make my son one identical “Jonah Story 2” ? I love all of your decorations. How did you do the toy story birthday sign? This has been the inspiration for both my boys’ birthday! Where did you find the font for the etch a sketch? I can’t figure that one out. You are amazing! I came across your post through Pinterest and absolutely love every decoration! I was wonder about the Sydney Story 3 sign? We are having a toy story theme birthday party as well for my son, and I am so interested in this sign. I believe you have an epsy shop, can you provide me with the name of your shop please? Also is it possible if you can email me the cloud image? Did you use a blue plastic table cloth for the background? Hi i would like to order a custom ( Sydney Story 3 sign). Can i reach out to you by email? or go do you have an Etsy shop? Hi i would like to order a custom ( Sydney Story 3 sign). Can i reach out to you by email? Love this post! Can you please provide me with your Etsy Shop? Would love to purchase some banners etc. Since doing this party are you selling or doing anything off etsy? My daughter 3rd birthday is coming up and really wants a toy story party!! I’d love to do the mr and mrs potato cutouts. FABULOUS ideas, and I am SO appreciative of your time to share! Would love to purchase a custom invite if you are still selling them. Thanks! I wish I could be as creative as you appear to be! Every detail turned out amazing. I am also going with the toy story theme for my son’s first birthday and am dying to know if you are willing to share your printable. Thanks in advance. You are too sweet! 😉 Email me [email protected]. Hi Jen! I was wondering if I could also have your Etsy information. Everything looks so wonderful! Thank you! I love all your ideas! My son’s birthday is coming soon and we are planning to have a toy story party. I just want to ask what are the dimensions of your etch a sketch prop? Hi Marisse – Thank you so much. I used a 20×30 piece of foam board from the Dollar Store (2 for $1) for the Etch A Sketch. I don’t remember how big I made the opening, but it was just whatever looked good when I looked at it. LOL. I think the frame was about 4 inches or so. The “knobs” were cut from the foam board middle that I didn’t need. Hope that helps. I am lucky my daughter has a fall birthday, so I found them in the Halloween section at the dollar store. I am really not sure where you would be able to find them off season, especially in bulk. Sorry! We’re doing a huge Toy Story bash for my little boy’s 1st Bday! Where in the world did you get the tiny aliens from the claw machine? I’ve been looking everywhere for some for some Goody Bags! Aren’t they cute?! You can buy a whole bucket of the Little Green Aliens from Amazon, http://www.amazon.com/Disneys-Story-Bucket-Little-Green/dp/B003V6BHKC/ref=as_li_ss_tl?ie=UTF8&keywords=little%20green%20alien&qid=1463015531&ref_=sr_1_2&sr=8-2&linkCode=ll1&tag=babubl-20&linkId=d1799b9f2352eeab05b86329382e2727. Have a great party! Amazing ideas! I’m putting the final touches on my son’s party and was wondering how exactly you made the claw? I have the foam board and foil, not sure what to do next lol. Thank you so much! I didn’t take pictures of the step by step because I made it up as I went, so I never wrote a tutorial. But basically, I sketched the shape with a pencil, and then used an Xacto blade to cut it out. You will need two claw shapes, which you will fit together. In one shape you will cut a slit down the top, in the other from the bottom up. That will let you slip them together at a cross. (Cover with foil first.) Then hang with monofilament. Hope this helps and good luck! Hi where did you get the plastic boots from? Funny story. When my husband’s grandmother past, we ended up with many framed family photos. The frames were the gold metal frames you could buy at drug stores in the ’80s – not my style. But I can’t throw anything away. With a little spray paint, I converted them into my favorite party decor – they have been painted and repainted several times to match the theme. So any cheap frame and some spray paint will work. Where did you get the price to out of the banner above the favor table, I need it for this weekend…my son’s 3rd bday party. Hi there. I love the way everything looked. It looked very well thought out and beautiful. I’m wanting to throw my son a toy story themed birthday party in a few months and I want to steal one of your ideas 🙂 because it’s so amazing! I’d love to know where to get the potatoe head printables as a craft to do at my sons party! Thanks Tracy! You can download the Potato Head Printables (for free) here – https://www.thesuburbanmom.com/2016/01/29/mr-and-mrs-potato-head-craft. Have fun! Awesome birthday party!! Thanks for the cool ideas. My son’s 4th is coming up and will be ‘borrowing’ some of your idea! Awe thanks!!!! Have fun party planning. Hi, great party ideas! I wanted to see where you may have gotten the Toy Story Banner printables or if you made them. This is for a 2nd birthday so I was hoping they had them with a 2 instead of a 3. I think you are referring to the banner with the characters each holding the “3.” Those were actually the movie posters for Toy Story 3. It’s the one thing I didn’t have to create because Pixar already had, I just printed the images. Sorry! Where did you order the Pez dispensers? I ordered them from Amazon https://amzn.to/2OVVIb1.